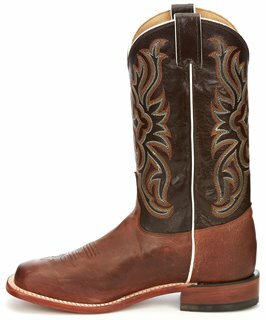 Rugged yet refined the Lashka Brown 12-inch tall San Saba™ Women's cowboy boot is inviting with a rich chocolate leather upper decorated by an orange and cream stitching with a centered cross. 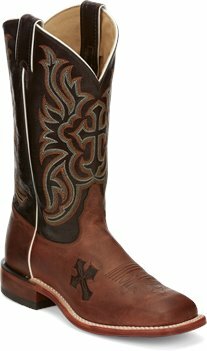 The white piping along the collar and quarters outline the classic western silhouette and the distressed golden brown vamp is accented by a dark brown cross. Its square toe and unit heel allow for a relaxed fit and the cushioned insole provides lasting support and comfort in and out of the saddle. The double stitched welt offers durability. This style is proudly Handcrafted in the USA with imported materials.